In my last blog post (Why managers (should) play golf), I noted the cultural accoutrements induced by the meritocratisation of managerial culture. I argued that the managerial pastime of golf, penchant for cigars, and palate for (fine-ish) wine were consequences of the need to create a shared form of capital along the lines elaborated by French sociologist Pierre Bourdieu. Now, as I noted in that post, it is clear that these forms of managerial capital are overwhelmingly male-dominant. 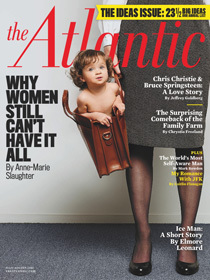 And that, of course, reflects the reality that upper-level management remains still a very male-dominated environment. That is not to say that the forms of managerial capital we specified should for any organic reason be male – their gender assignation is fundamentally arbitrary, for why should women not enjoy golf, smoke cigars, or down spirits. But their value as capital reflects the gendered environment in which they have been negotiated and determined; hence, their gender value is amplified by the managerial culture they have come to symbolise. I am driven to muse further upon the managerial culture to which I alluded in my last post as a result of the interesting debate sparked by Anne-Marie Slaughter’s headliner article in the American periodical The Atlantic Monthly, entitled “Why Women Still Can’t Haveit All.” Slaughter, a tenured professor at Princeton and dean of the Woodrow Wilson School of Government, held a very senior position in the US State Department as the head of policy for two years, and her article is part memoir (reflections on balancing work and family when you are commuting to work while having a rebellious teenager at home), part social advocacy. As the article’s current rank (#2) in Google’s predictive search text suggests, the article has generated a lot of attention. (I have included a screenshot from that search, since it is an inadvertent testament to the state of gender identity politics). Now I am not the only one to observe that an article written by a woman who is a tenured professor and dean at one of the world’s most prestigious institutions, who travels around the world to give talks, who interacts with and teaches some of the brightest minds of her society, who enjoys a stable family relationship (she is married to another tenured Princeton prof), has a nanny, lives in a wealthy enclave, and who commands both the respect of and admiration from her peers, that an article written by this person entitled “Why Women Can’t Have it All” smacks a little bit of hubris, since all this certainly sounds like “having it all”; there are probably few who would think to add the addendum “oh that and creating foreign policy for the world’s remaining superpower.” There are doubtless many who would love to be faced with this kind of problem; reading about her problems working at the State Department is a little like reading a restaurant review that complains the service was too slow in bringing out the caviar. BUT – it seems to me Professor Slaughter is exactly right in many of her arguments, so we should look beyond her class privilege and the fact that most of her reflections seem to derive from discussing career prospects with high-powered graduates from Ivy League programs to consider the substance of what she has to say as it applies more generally to the standards of achievement in professional culture and the paths to acquiring power and responsibility.